Central Florida students recreate missions flown by the Tuskegee Airmen using Lockheed Martin’s Prepar3D simulation software. Launched in 2008, the Lockheed Martin/YMCA Technology Center engages students in math and science, creating a foundation for success in the classroom and in future careers. Florida middle schoolers had a chance to hear from the legendary Tuskegee Airmen and fly in Lockheed Martin Prepar3D during a February ceremony at the South Orlando YMCA Family Center. Supporting science, technology, engineering and mathematics (STEM) education, Lockheed Martin also presented $103,000 in contributions and grants to the YMCA and Oak Ridge High School at the event. Of that sum, $58,000 was directed to support one year of programming at the Lockheed Martin/YMCA Technology Center, the addition of the “Vision of Flight” Aviation Technology Program and the YMCA Teen Achievers engineering cluster. Oak Ridge High School received $45,000 in the form of a Project Lead the Way grant and support for its FIRST Robotics team. The “Vision of Flight” Aviation Technology Program will begin in the summer at the Lockheed Martin/YMCA Technology Center, providing students the opportunity to explore the fields of aviation and aeronautics using computer-based simulation and hands-on training. The Technology Center was created in 2008 when Lockheed Martin and the Central Florida YMCA partnered to open the nation’s first community-based high-tech learning center. Together, they continue to engage students in math and science, creating a foundation for success in the classroom and in future careers. 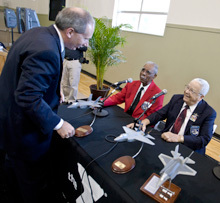 Lockheed Martin Global Training and Logistics Vice President of Engineering Chester Kennedy greets two members of the legendary Tuskegee Airmen. The Airmen participated in the “Vision of Flight” Aviation Technology Program launch, geared toward providing students the opportunity to explore the fields of aviation and aeronautics using computer-based simulation and hands-on training. Seated with his fellow Airmen, Lt. Col. Gray noted that sleekness had been carried over to Lockheed Martin’s F-35 Lightning II, the nation’s newest fifth-generation fighter whose three variants will replace at least seven types of aircrafts around the world. Reflecting on the impact education and engineering have had on his career, Lt. Col. Gray told the audience that he wanted to be an engineer his entire life, eventually earning both bachelor’s and master’s degrees in the field. “There is no limit. If you want it, go for it,” Lt. Col. Gray said. In addition to the “Vision of Flight” Aviation Technology Program launch, Lockheed Martin employees showcased the engineering impact to everyday life and career opportunities made possible by studying science and math through facility tours and school visits Feb. 20-24. Founded in 1951 by the National Society of Professional Engineers, National Engineers Week is designed to increase public awareness and appreciation of engineers and to encourage pre-college interest in STEM. National Engineers Week is celebrated annually by thousands of engineers, engineering students, teachers and leaders in government and business. Orbx have announced the immediate availability of their New Zealand South Island (NZSI) scenery addon as a Side-by-Side License (SBSL). This license will activate NZSI in Lockheed Martin Prepar3D if you have a copy of Orbx FTX NZSI installed for Microsoft Flight Simulator X (FSX). TropicalSim have released Porto Franciso de Sá Carneiro Airport for Prepar3D®! Welcome to Portugal. Welcome to Oporto, or Porto as it’s known outside the English speaking countries. The Airport, Franciso de Sá Carneiro has gone through some changes in the recent years, expanding from a small terminal to a state of the art glass terminal building with jetways and all the confort you’ll see in today’s most equiped airports. The airport was considered in 2007 Europe’s best regional airport, although it does carry many international flights. The airport is expected to grow in the future, with more buildings, more ramps and more parking spaces. The scenery features the airport in it’s complete state as of today, including ongoing construction to the oposite side of the runway from the main terminal. We are very pleased to inform the community that Orbx have announced availability of a Prepar3D license for FTX Australia SP4. Great news and a great product! Get an insider’s tips about Lockheed Martin Prepar3D by watching our new tutorial videos! Software engineer Max Perry provides step-by-step directions highlighting what you can do in Prepar3D. The first two tutorials walk you through how to join and host training sessions in Prepar3D using its multi-player capability. Get connected with colleagues around the world in distributed training exercises and take your preparation to the next level. Watch the tutorials at our videos page.